Funny, during some of the time that Jason was listening to the system I was talking to Albert Porter about cameras. Albert is a photographer and thinks nothing of spending big bucks for cameras whereas I agonize over spending $1200 bucks (and get looks from my most significant one like I was crazy for spending that kind of money 🙂 ). Anyway, we effectively got kicked out of the room because we were making too much noise (which we were – apologies to everyone – but I was spacing out being so intent on trying to pick Albert’s brain because over the years as I get better at photographing hardware, the better his photos look in comparison to mine – I know, kind of backwards, but it is true). I guess that is one of things about shows – it is both a social event and a listening event – and the two are really quite incompatible. Anyway, we just want to thank Jason for his nice report. Listening room number two South side mess. Look Ma, no TV! Yes, it is true, no video with high-end audio for Mike until we get a front projector (90% chance it will be the Sony Ruby). This is where the Marten Coltrane Supremes will go. 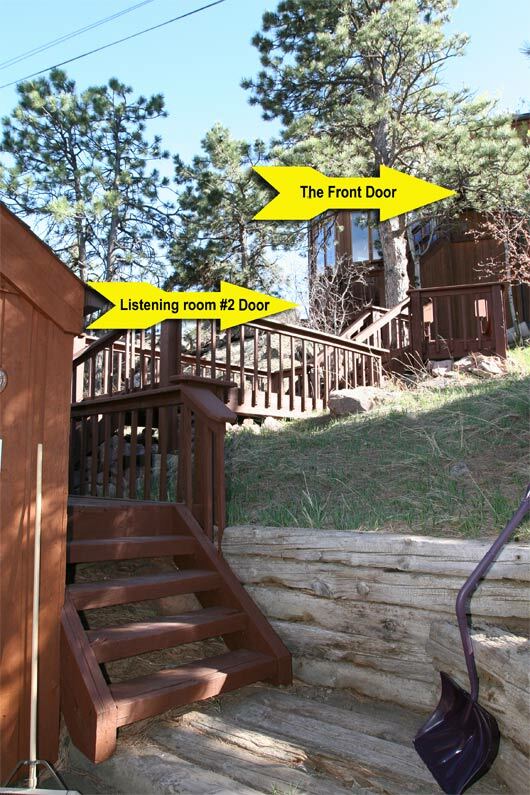 You can’t tell it from this picture, but the view out the windows is very nice – the same view as our main room, but a little more intimate because it is closer to the ground and the trees block more of the view. 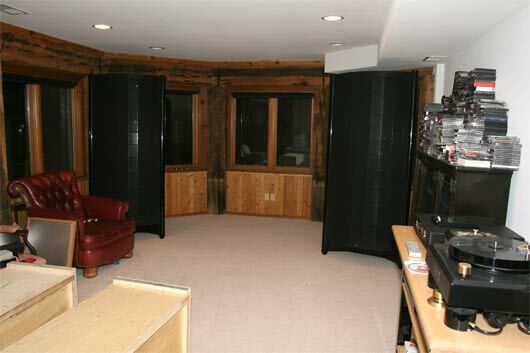 Putting the Coltane Supreme loudspeakers here will allow us to learn about how to setup these puppies in a more-or-less reasonably sized room (15 x 27 x 8 feet tall). 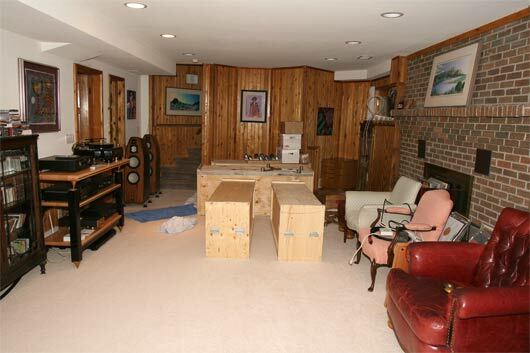 The SoundLab Ultimate loudspeakers you see here are going to be moved to the North side of listening room #2. Listening room number two’s North side mess. 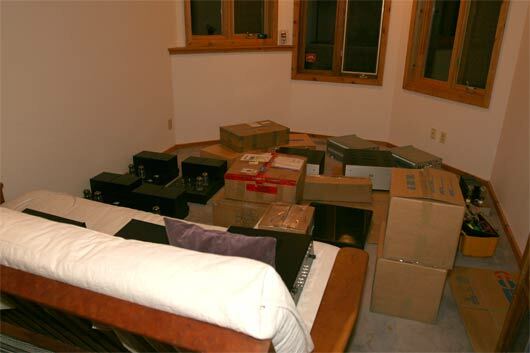 These crates are the crates for the Coltrane Supremes. Yay, we got them up the 30+ steps up from the garage to this lower level – and by just the two of us (with an extra push from an industry rep who shall remain namesless for the time being – it was great seeing you guys!). Now comes the hard part, picking which racks to put where and which components to set things up with initially. I want to put the double-wide RixRax here on the North side, but instead of in the normal configuration (which would trap a lot of space behind the rack because it is a doublewide and the wall is shapped like the end of a octagon) I want to position it so that it sticks out into the room – so that there is easy access to both the front (i.e. what would not be the left side) and the back (which would now be the right side). But Neli thinks I am crazy – especially now that I have proposed this non-standard orientation for the rack. [This system sounded so AWESOME on the smaller Coltrane loudspeakers – we are hoping this awesomeness transfers to the big boys]. [We used this system to break in the M10, but it sounded so wonderful – the Soundlabs really sounding organic and warm enough to compete with speakers costing a heckuva lot more than the $31K that these go for]. Of course, all this could change today as we move stuff around. They liked our all Audio Note room (what is not to like), but had an interesting take on our other room. This is so funny, because we quite worried that the system would be overly loud. This system had a tendency to play at really high volumes, and with such amzingly low amounts of distortion it was sometimes hard to tell just how loud it really was. It was my choice to put on “Suite Judy Blue Eyes”, which is what I think I put on from that album at that time (one of my all time favorite songs – along with most of the other songs on that LP – along with most of their other LPs – and all of Neil’s LPs. I know we played Cinnamon Girl but I do not remember Down By the River… Oh well, next show :-)). I also played a whole album side of Abbey Road. which I also played at pleasant volumes (you had to talk loudly to be heard over it but not shout). And Peter Tosh ‘Legalize It” [THAT we played LOUD]. Yes, they are somewhat compressed and my playing it was to some extent risky. Why? Because they aren’t AUDIOPHILE SHOW APPROVED. There is an AUDIOPHILE APPROVED volume. There is an AUDIOPHILE APPROVED artist and track list (somewhat dependent on the particular audiophile). There is an AUDIOPHILE APPROVED song length. There is an AUDIOPHILE APPROVED recording quality. There is an AUDIOPHILE APPROVED drum solo length (OK, we all have this :-)). There is an AUDIOPHILE APPROVED amount of Partricia Barber and Diana Krall (which now rests at zero :-)). Personally, what I wanted to show at RMAF is that our systems can play music people actually want to listen to. And we did and it worked. The room was packed just about the whole show (re: lack of pictures I was able to get out of the room to take this show – but we did take around 1000). We played Stevie Ray Vaughn at live show levels. …and we played Holst the Planets where you soemtimes had to strain your ears to hear what was happening (and hold on to your seats 30 seconds later). As this post concludes itself, I want to talk about how much fun it is to DJ at a show. First, a show is like one gigantic party. I mean, 1000s of like minded people kind of mill around, wandering from room to room amoungst 100s of rooms, listening to tunes, chatting with friends, playing their own CDs her and there, hearing new music, getting to play it louder than their situation at home may allow… It Is A Blast. Now imagine you get to DJ in one of these rooms. A room is like a Club. The DJ gets to play music they like and that they think the Club goers will like. There is a lot of “Oh, I bet people will think this is cool.” or “This is such wonderful music, and it brings back such memories and it sounds amazing better now that it did on my old plastic turntable (or 1st generation CD player for you younger people out there 🙂 … or first IPOD for you even younger people out there :-))”. Often, I like to play quiet peices between pieces that rock out – kind of like Led Zepelin albums, or even Deep Purple [although some albums are just one long intense nuclear rocket-powered roller coaster ride :-)] . Have you noticed that they interperse quiet or acoustsic tracks in amongst the adrennilin-inducing ones? Well, people at a show are no different – sometimes we need to recover a bit after a particularly emotional, or aggressive, or delicate, or nostalgic …piece. So as a newbee DJ, I practice the “Mix It Up” technique of realtime playlist generation. We all have our personal tastes… We can’t play AC/DC or Sonic Youth, or… with Neli in the room, We can’t play anything from Hell Freezes Over with either Steve or Neli in the room, we can’t play hip-hop or rap with anyone else in the room but me (and Ben 🙂 ) …. :-) etc. etc. Anyway, being DJ at a show allows one to play not to a captive audience, but an interested one, which is much more fun, much more challenging, and much more rewarding. We want to thank everybody for visiting our room. We hope you enjoyed your stay. Thank you and good night.